Over the last decade in India, many cities have undertaken pathbreaking initiatives in resolving issues associated with urban transport, and, specifically, mass transit system. The Bus Rapid Transit System (BRTS) is now acknowledged as a key mode to help large-scale mobility of people. Today, eighteen cities in the country are at different stages of planning, design, execution and operation in their BRTS journey. 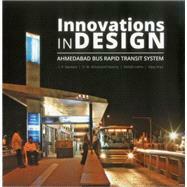 The Janmarg, as the BRTS is known in Ahmedabad, explored many options before choosing its design approach. Many of these experiments led to innovations and best practices. Since its inauguration in October 2009, Janmarg has been accepted as the first 'complete' BRTS in India. This book traces the design journey of Janmarg, the alternatives that were considered, the rationale underlying the choices made, the innovations it fostered and lessons for the future for Ahmedabad and for other cities. The volume will be valuable resource for researches as well as students. Background; BRTS Design; Basic Layout; Cross Sections; Junction Design; Placemaking; Street Design Elements; Transit Infrastructure System; Ideas for Future.